“Is he asleep?” Rosh asked, as he entered the home and removed his shoes. “Yea,” said Isha. She smiled up at him from the couch, where she sat watching TV alone. She nodded absent-mindedly, already engrossed again in her TV serial. He walked up to Hosh’s bed and bent down to give the softest of pecks on his sleeping son’s cheek. Before he knew it, two little arms went up around his neck, pushing him down on the softly heaving chest underneath him. “Humma!” urged the sleepy voice urgently. Happily, he complied, lifting his son’s small, half-asleep frame up into his arms and hugging him tightly. “Story,” the sleepy voice whispered. “Okay,” he obliged, getting under the sheets with his son. Hosh hugged him tightly. Disturbed by their flurry, the lion awakened suddenly, and caught a mouse as it fled down his paw. 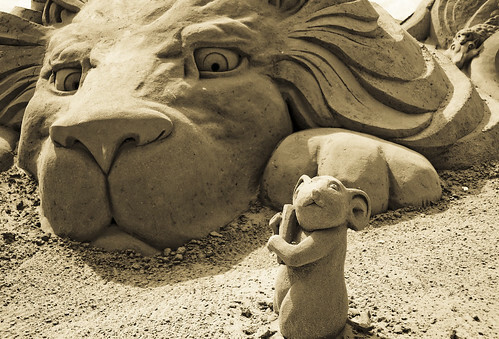 Clutched between the huge claws, the poor little mouse looked up at the huge big eyes of the lion. He felt fear, like he had never felt it before. The lion’s huge head loomed down upon the mouse to sniff it. ‘I’m going to die,’ thought the little mouse, panic rising in his guts. He pleaded for his life. “Grrr,” grumbled the lion, annoyed. He was irritated at having been awakened from his nap, but he wasn't really hungry. Still, he couldn’t just let a captured prey go. The little buggers had to be taught some respect. They couldn’t just run all over him - the king of the jungle - without some harm coming to at least one of them. So, he prepared to bend down and eat the little brat. “I’ll be stuck between your teeth,” the mouse screamed. “What?” the lion stopped dead, not really understanding the little guy. “Like eating a few potato chips makes us hungrier for dinner,” Hosh sought clarification, his eyes now wide open. “Precisely,” Rosh purred and continued. The audacity of the mouse surprised the lion. He looked at the mouse with renewed interest. The mouse looked back at him, saying no more, pleading no more. The little mouse's words had struck one right chord. A warm compassionate glow slowly enveloped the lion. Reluctantly, his paw opened. In an instant, the mouse was gone. Months passed, and the lion forgot all about the little mouse. One day, as he was hunting in the forest, the lion got trapped in a hunter’s snare. He roared in anger. But he couldn't pull himself free. He roared in frustration. But he still struggled in the net. He roared in fright. But no one came to help him. He roared and roared. The jungle reverberated with his roars, scaring away all the other animals. But his constant roars alerted one little mouse - far, far away in the jungle. The mouse heard the unusual roars and remembered a past debt. Cautiously, he raced out to investigate. The lion had tired by now, and his pitiful snarls came in low and slow. The mouse peeked out through the tall grasses as he neared the fearful sounds. He finally saw the trapped lion. Fearfully, he stepped out of the safety of shadows. The lion looked at him but did not recognize him. Losing all hope, he groaned helplessly. The mouse gathered his courage and inched closer to the trapped lion. The lion ignored him. Slowly, fearfully, the mouse tiptoed towards the lion’s back, grabbed a rope connection and gnawed through it with his sharp teeth. The twine spliced finally. The lion felt a part of the net give way. Now he was still, his senses once again alert to the motion and sounds behind him. The mouse stepped up to another twine in the trap, and nibbled away at it until it broke. Now he had the lion’s full attention. And his remembrance. The lion hoped against hope, as the mouse swiftly worked behind him on his trap, painstakingly slicing through the chords that bound him down. Ties sprung open one after the other with painfully slow regularity, but eventually the lion sensed freedom. He flexed his muscles and shook violently, springing the trap once and for all. He was free once again! The mouse jumped back into the safety of shadows. The lion turned to thank his savior, but the little mouse was long gone, racing away as fast as he could.